This is a Guest Post by Anoop Sudhakaran, who focuses on the following niches – SEO, Blogging, Social Media & writes on his blog Hacktabs. If you would also like to write a Guest Post for us, then hit the ‘Become A DailyBlogger‘ page, read the Guidelines, Register and submit your post for review. Blog commenting is a way to keep in touch and show gratitude to the author of the post. But many people are too lazy to fill up the comment form and just leave the post after reading them. We also know that commenting on a post helps the commenter get a backlink (if dofollow). Hence this post is for all the people who find it lazy enough to type in the Name,Email and URL everytime. This post is certainly not for those people who are looking for easy comment i.e. spam commenting. Blog owners stay away from such comments and use one of these AntiSpam WordPress Plugins. Always try and post quality comments after reading the post well. This will invite lot of clicks and replies to your comment and thereby increase your blog’s reputation. Before you read this post, you may like to take a look at some of our previous posts which will give you some blogging tips. Install the plugin from the addon repository. Restart the browser after installing. After installing you will get the Autofill Form Icon next to the Address Bar. Click the Arrow in the icon and select Settings. Select all the default Columns in the profile except the following : Username, E-Mail, Homepage and delete the rest of the columns. 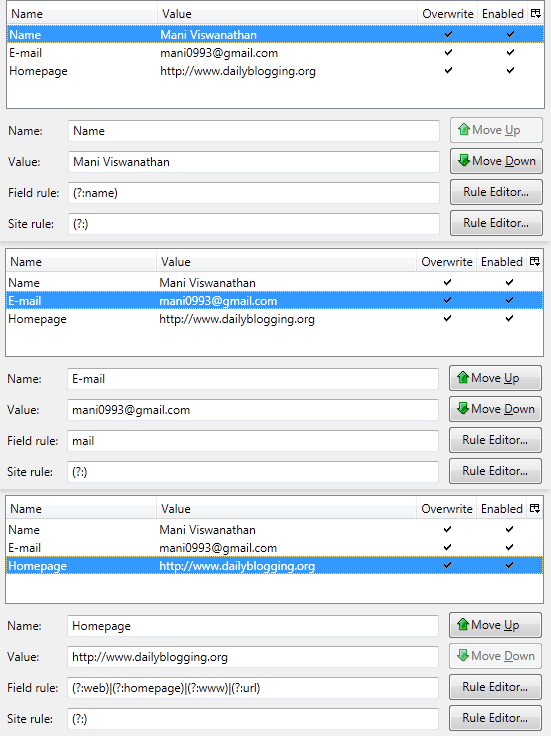 Edit the Username, Email, Homepage fields (Refer the above image). Next time you want to fill in the comment form of any Blog or any Website just press the shortcut Key [Alt+J] and the comment form will be automatically filled in. You can also add other fields to the form filler like Twitter Handle by pressing the Add button in the settings and filling in the profile. If you liked this small tutorial then subscribe to Our RSS Feeds / Daily Updates. Hope you all liked the post and will try and implement it.Do share your comments or queries with us! I love commenting on dofollow blogs. I’ll definitely use that software to make my work easier. Thanks for sharing this plugin i will try this and give a feedback. Nice Post Anoop. One can also use the latest Google Toolbar 7 . It also has the auto filling feature inbuilt. Hi Anoop this trick is great but now a day almost all the browsers saves there details. That is great, I love using the auto fill myself. But, I don’t usually use it for my URL. Part of that is because I use different urls from my site to get some deep linking going on. I love blog commenting. Beside we can get backlinks, we also can get more relationship between related topic blogs. This can be pretty handy and time saver plugin. Thanks for this. I really need this while commenting on dofollow blogs. Great share friend. Thanks for the tip… I have been using autofill addon for a long time… Looks like i have to setup another profile for filling comments. That is a great tip. Commenting can be hard when they don’t fill the form for you, and if you get really into a blog it can keep you form returning by having to go through too many steps. thanks, doesn’t seem THAT easy, but should dget the job done. wish 1password just had the capability. Is there any blog commenting extension for Google Chrome? Thanks for the trick Anoop. It really would save a lot of time. A very handy trick. Mozilla’s auto fill add-on also helps but not compatible with 3.0+ versions.